The copier in your office might be a source of frustration when it acts up, but it’s a vital part of your daily operations. Keeping your office equipment in tip-top shape it critical to productivity. Keep these five tips in mind to keep your office copier running smoothly. Every copier has a paper capacity, and there is usually a line indicating how high you can fill the paper. Never overfill it. Keep in mind that thicker paper means the tray will hold fewer sheets. Ensure all paper in the tray is dry and not crinkled because these can cause the printer to jam and result in low-quality prints. It’s tempting to open the drawers of the copier when a jam occurs to find out what’s wrong, but read what the screen says and follow the instructions to fix the issue. A small piece of ripped paper could get stuck and require a service technician with copier repair expertise to fix. A tell-tale sign that your copier needs service is if you see lines running down the paper. Lines could indicate a problem or a dirty roller that requires an experienced technician to repair. Jammed pages or loose toner can also cause lines to form. Try making a few blank copies if you aren’t ready to make a service call just yet. Try cleaning the glass on the copier to remove smudges or dirt that can create imperfections on your fresh copies. Don’t try to save a few bucks by using a toner that isn’t specifically designed for your copier. 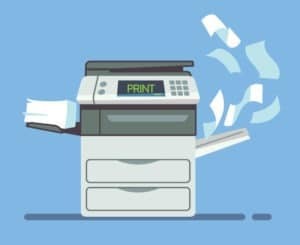 Using the wrong toner can cause problems with your machine and even void your warranty, which can be a serious problem if your copier needs a major repair down the road. Definitely avoid combining toners from one container to another. Purchase a copier that suits your office needs. You won’t save money by purchasing a cheaper model if you have to use it more than the manufacturer recommends. You’ll either end up needing to place more printer repair service calls or replace it sooner than anticipated. Your copier is one area that you shouldn’t cut corners on. It’s an essential part of your daily operations and needs to be serviced and taken care of if you want it to last.